Location: Kanjanoor near Kumbhakonam . Description: This Shivastalam is associated with Sukran - representing the plant Venus and is - regarded one of the nine temples in the Thanjavur area linked with the Navagrahams. Maintained by the Madurai Adhinam, it is located in a quiet hamlet in the vicinity of Tiruvaavaduturai, Suryanar Koyil and Tirumangalakkudi, near Tiruvidaimarudur and Kumbhakonam. This shrine is also referred to as Palaasavanam, Bhrammapuri and Agnistalam. Kanjanur is considered to be the 36th in the series of the Tevara Stalams located in Chola Nadu north of the river Kaveri. Legends: Bhramma is said to have been blessed with a vision of Shiva's marriage with Parvati here. Agni is said to have worshipped Shiva here, hence the name Agneeswarar. 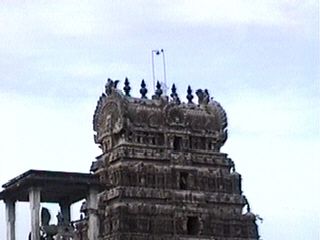 The Temple: This temple with a two prakarams has a five tiered Rajagopuram at its entrance. Haradatta Sivacharyar is said to have composed many works in sanskrit here. 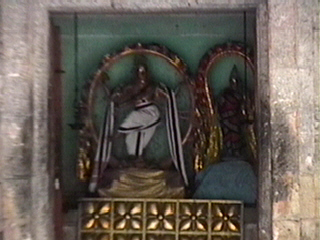 Images depicting legends related to Haradatta Sivacharyar are seen in this temple. There are also shrines to Maanakkanjaarar Nayanmaar and Kalikkaamar here.